In its home country (Portugal) the Portuguese Water Dog is also known as the Portuguese Fishing Dog, Diving Dog or the Sea Dog. This is because fishermen often used them to guard their boats and the catch. This practise is no longer common and today its main role is to serve as a faithful companion. This breed of dog can live up to 14 years of age. These dogs are extremely loyal and affectionate and are sensitive to their owner's moods, but if not handled correctly can be quite stubborn. Boisterous and strong willed, these dogs are blessed with great stamina. Very alert, they will let you know immediately when anyone comes to your home. Portuguese Water Dogs make brilliant companions, but will want to be a part of your daily routine. When brought up with other pets in the home, they will form a strong friendship and respect for each other. They generally get on very well with other dogs when outside their home environment. Grooming is very important for this breed as its coat doesn't shed and needs to be brushed thoroughly at least twice a week to prevent matting and tangling. For the Portuguese Water Dog to thrive it needs owners who have the time to give regular grooming sessions and an exercise routine that includes plenty of swimming. Sound training is also essential for this dog to be happy and healthy. 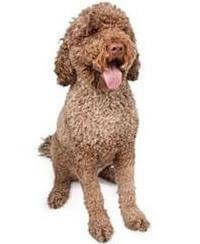 It is also a good breed for people with allergies because its coat doesn't shed.